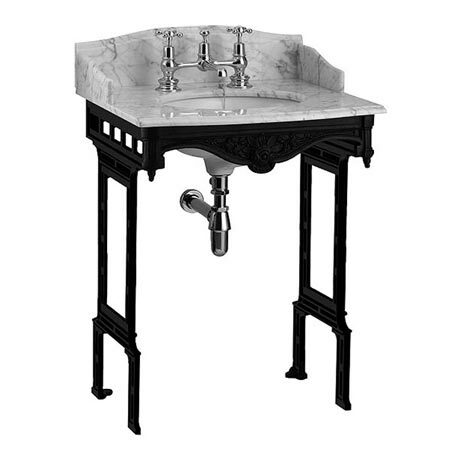 The Burlington Georgian Carrera Marble basin with a beautiful black aluminium wash stand, the beautiful velvety soft pebble grey marble provides an eye-catching and gorgeous focal point in your vintage setting. It's classic design brings a touch of elegance to all Bathrooms. All granite and marble is treated with SCI Stone Spray-N-Seal, a water based penetrating sealer that protects natural stone surfaces and limits water ingress and staining. All Basins are factory fitted to the marble/granite for stability in transportation, and to ensure the basin is properly fitted in the correct position. Product comes as standard with 3 setup options- Plain Basin, Basin with Back Splash or Basin with back & side splash - Visible in additional images. Please purchase taps,waste and exposed trap separately. This is the second purchase from Victorian plumbing and has met my expectations yet again, fantastic price and quality. The service is second to none, easy to order and so easy to track where your purchase is every step of the way, that is if it's not already being delivered. Thank you Victorian plumbing for a fantastic service.